Fremont, California, USA, June 24, 2010 - Patriot Memory, a global pioneer in high-performance memory, NAND flash and computer peripheral solutions, today announced the immediate availability of the Viper II Series ‘Sector 7’ Edition to its family of Extreme Performance DDR3 memory. The Sector 7 Edition DDR3 is the ultimate performance memory solution for the Intel® X58 system platform and has been designed with overclockers, enthusiasts and gamers in mind. Sector 7 modules are compatible for use with Intel® ‘unlocked’ Core™ i7 and Extreme Edition Core™ i7 processors. Patriot’s Sector 7 Edition is available in 6GB, 12GB and 24GB tri-channel kits in speeds ranging from 1600MHz to 2000MHz. 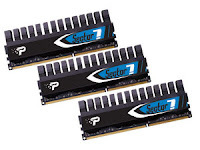 The Sector 7 Edition products are an extension of the well received dual-channel Sector 5 Edition line of DDR3 for the P55 platform. The Viper II Series Sector 7 Edition is built using only the highest quality pre-sorted IC’s available and are subjected to rigorous testing and validation on the X58 platform to achieve optimized performance and maximum quality. Designed with an extruded aircraft-grade aluminum heat spreader, Sector 7 Edition modules quickly dissipate heat from the modules resulting in improved stability and reliability during extreme overclocking conditions. Each module is 100% hand-tested for quality assurance and is backed by a full lifetime warranty and industry leading customer service. Patriot Memory designs, manufactures and markets high performance, enthusiast memory modules, flash products, and computing technologies. Patriot products have become world renown for their extreme performance, reliability and innovation. Patriot Memory sells its products through original equipment manufacturers, retailers, e-tailers and distributors throughout the world with operations in North America, Asia and Europe. Patriot Memory’s parent company, PDP Systems, Inc., was founded in 1985 and is headquartered in Fremont, California, USA.